Date written: Approximately 571 B.C. Key people: Ezekiel, Israel's leaders, Ezekiel's wife, Nebuchadnezzar, "the prince"
During the years of his prophetic ministry, Ezekiel acted out numerous symbolic role plays to communicate his message. Symbolized the impending siege of Jerusalem by the Babylonians. Represented the number of years that the two nations of the divided kingdom would undergo God’s judgment. Symbolized the dispersion of the Jews among the Gentiles, as well as the famine conditions that would prevail during the siege of Jerusalem. Symbolized the various things that would happen to the inhabitants of Jerusalem (5:11–12). Represented the breach of the walls of Jerusalem, the capture of King Zedekiah, and the exile of the survivors to Babylon. Signified the dread that would fall on the land of Judah. Signified news of the Lord’s impending judgment. Indicated the two paths that Nebuchadnezzar’s army would take—one to Jerusalem and the other to Ammon. Represented the silent grief that the exiles would feel after the fall of Jerusalem. Symbolized the rejoining of the Jews in a reunited kingdom under God’s leadership. Word in life study Bible . 1997, c1996 (electronic ed.) (Ez 4.1). Nashville: Thomas Nelson. A parable is a truth wrapped in a memorable story or word picture. It could be fictions, dramatized, or the result of a vision. Jesus gave much of His teaching through parables (See “The Parables of Jesus Christ” at Luke 8:4). So did several of the Old Testament prophets, including Ezekiel. Symbolized the way in which Judah had become useless to the Lord and now served no other purpose than to be burned up in judgment. Illustrated the nation’s betrayal of God’s love and compassion. Illustrated the foolishness of King Zedekiah, whose rebellion would bring Nebuchadnezzar’s troops to destroy Jerusalem. Explained the way in which God was going to purify His people through the “heat” of the seige of Jerusalem. Symbolized the spiritual adultery of Israel and Judah. Symbolized the way in which God was going to “turn up the head” on Jerusalem in order to cleanse it of its impurities. Illustrated the judgment that was going to fall on Tyre. Signified the worthless leaders of Jerusalem and how God would deal with them. Symbolized the spiritual renewal of the nation of Israel. Word in life study Bible . 1997, c1996 (electronic ed.) (Ez 15.1). Nashville: Thomas Nelson. (1) Solomon’s Temple. The construction of this temple by Solomon was a fulfillment of David’s desire to build a “house for the Lord”- a desire which he ws never to realize in his lifetime (2 Sam. 7:1–29). The temple ws built after the death of David and dedicated by his son (1 Kin. 8:1ff). This temple was destroyed by the armies of Nebuchadnezzar at the fall of Jerusalem in 586 B. C. (Jer. 32:28–44). (2) Zerubbabel’s Temple. This is the one under construction during the ministryof the prophet Zechariah. It was completed and dedicated in 516 B.C. (Ezra 6:1–22). It was constructed under the direction of Zerubbabel (Ezra 3:1–8; 4:1–14) who was a descendant of David (1 Chr. 3:19). This temple was desecrated in 169 B.C. by Antichus Epiphanes. (3) Herod’s Temple. Restoration of Zerubbabel’s temple began in 19 B.C. under the administation of Herod the Great. The temple was nearing competion in A.D. 70, after nearly 90 years of renovation and enlargement, when it was destroyed by the Romans. Since this time there had been no temple in Jerusalem. (4) The Present Temple. There is a temple in which the Lord reigns at present. According to 1 Cor. 6:19 and 2 Cor. 6:16–18 the present temple of the Lord is the heart of the believer. There the Lord reigns until the day when the Messiah will return and set up His earthly kingdom and the millenial temple. (6) The Millennial Temple. This is the temple that is described in detail in Ezek. 40:1–42:20. It is this temple that the prophet Zechariah has in view in 6:12, 13. It will be built by the Messiah Himself, who will rule in it as the righteous Priest-King of His own millennial kingdom (6:13). (7) The Eternal Temple of His Presence. This temple is presented in Rev. 21:22. John says there will be no physical temple in the eternal kingdom because “...the Lord God Almighty and the Lamb are its temple.” This temple will be the greatest of all and it will be the focus of the eternal kingdom as it is presented in Rev. 21; 22. New Geneva study Bible. 1997, c1995 (electronic ed.) (Ez 48.30). Nashville: Thomas Nelson. Babylonian names (B) for the months are still used today for the Jewish calendar. Canaanite names (C) were used prior to the Babylonian captivity in 586 B.C. Four are mentioned in the Old Testament. Adar-Sheni is an intercalary month used every two o there years or seven times in 19 years. Served as a prophets to the exiles in Babylon from 593-571 B.C. Ezekiel and his people are taken to Babylon as captives. The Jews become foreigners in a strange land ruled by an authoritarian government. Because of the people's sins, God allowed the nation of Judah to be destroyed. But there was still hope - God promised to restore the land to those who remained faithful to him. God never forgets those who faithfully seek to obey him. hey have a glorious future ahead. While Jeremiah was prophesying in Jerusalem that the city would soon fall to the Babylonians, Ezekiel was giving the same message to the captives who were already in Babylon. Like those in Jerusalem, the captives stubbornly believed that Jerusalem would not fall and that would soon return to their land. Ezekiel warned them that punishment has certain because of their sins and that God was purifying his people. God will always punish sin, whether we believe it or not. 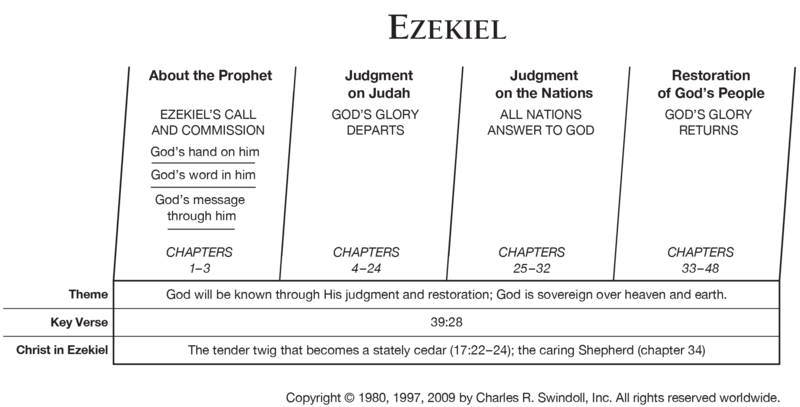 Ezekiel condemns the sinful actions of seven nations. The people in these nations were saying that God was obviously too weak to defend his people and the city of Jerusalem. But God was allowing his people to be defeated in order to punish them for their sins. These pagan nations, however, would face a similar fate, and then they would know that God is all-powerful. Those who dare to mock God today will also face a terrible fate. After the fall of Jerusalem, Ezekiel delivered messages of future restoration and hope for the people. God is holy, but Jerusalem and the Temple had become defiled. The nation had to be cleansed through 70 years of captivity. Ezekiel gives a vivid picture of the unchangeable holiness of God. Wee, too, must gain a vision of the glory of God, a fresh sense of his greatness, as we face the struggles of daily life.